You are cordially invited to a birdshot social in central Manchester on Saturday 22nd April 2017. Details on the poster below. Please email info@birdshot.org.uk to RSVP or call David on the telephone number given if you are planning to come We need to know numbers so that we can cater accordingly. There is not charge for this social, but you are welcome to make a donation to the Birdshot Uveitis Society if you would like. We are very grateful to our hosts the law firm DWF llp for kindly providing their conference facilities to us and a map of DWF’s location can be found here. If you require carparking please also let us know. As before, this event will be taking place on the beautiful Thames Sailing Barge ‘Phoenician’ which is situated in St Katharine’s Dock, immediately adjacent to Tower Bridge, London. You are free to drop in at any point during the day, but make sure you are there in time for our speaker at 2.00pm whom we are certain you will not want to miss. As usual, we will be serving drinks and finger food and providing a place where you can chat to others with Birdshot, exchange ideas and information and be part of the Society. We are extremely fortunate that the interesting and unusual venue for this event is provided by Board member and trustee John Hall. We do hope that as many of you who can easily travel to London and who would like to meet others with Birdshot are able to join us. We are suggesting a donation of £20 per person for the event, but it will be free of charge to members on benefits or low wage. Please RSVP to annie@birdshot.org.uk to let us know you will be coming so that we have some idea of the likely numbers. Due to various circumstances, we decided that it would be sensible to postpone our North West meet-up (planned for September) until April next year. We apologise for this change of plan. The proposed date is now Saturday 22nd April, and provisionally we will be holding it at Henshaws in central Manchester, as this provides a convenient location with transport links. The time will be from 11.00am – 3.00pm. The meeting is kindly being organized by BUS members Barrie Standish and Nick Bucknell, who are both active members of the Society. 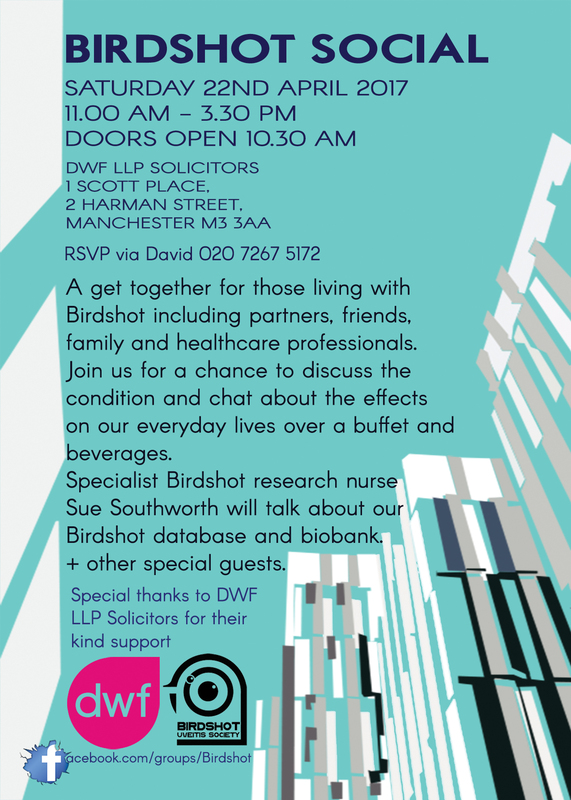 As well as being a social event with lots of opportunity for chat and something to eat, we plan to have a couple of talks, and if possible to run a data and blood collection session for the Birdshot Database and Biobank. We are currently trying to work out the logistics of this to see if this will be possible. If it is, this would enable members from the North West and North East of England to contribute samples and information for future scientific research into Birdshot. Initially, the main centres for sample collection will be in Bristol, London and Birmingham and Manchester, but we don’t yet have arrangements with other hospitals in the north such as Leeds, Liverpool, Newcastle Sheffield and Yorkshire. If you are interested in attending, please put the date in your diary and email info@birdshot.org.uk to allow us to put your name down as someone who is interested in coming along so that we can gauge numbers and make sure the venue is big enough! 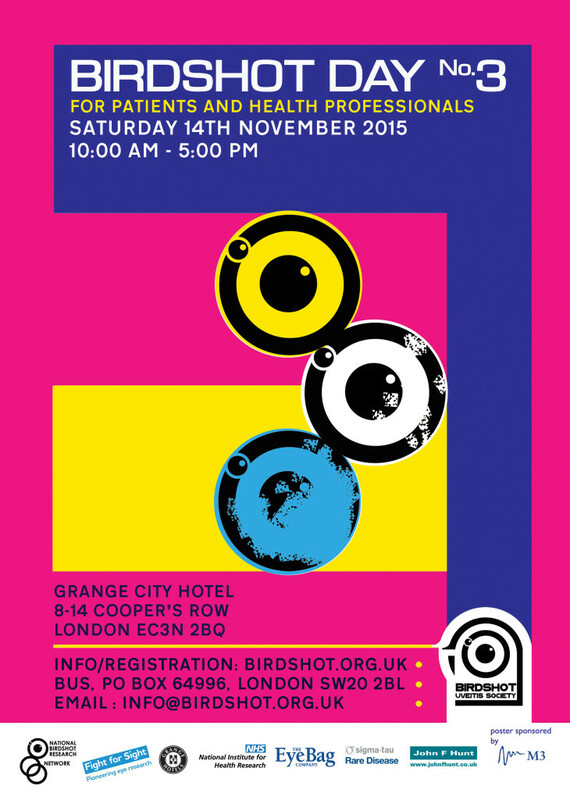 Here is the poster to advertise our forthcoming No 3 Birdshot Day on Saturday 14th November 2015. The poster has been designed by David Bethell, one of our trustees and directors, who is also a graphic designer. As before, David has given his time for free. M3 Global who are the healthcare marketing company that we helped earlier last year have sponsored the printing costs. Thank you so much to you both M3 Global and David for their help with this. If you would like to make sure the poster is put up in the hospital where you are treated, please let us know and we will send you a copy, so you can arrange this for us. Publicity throughout the UK is most important, as we would like this to be the biggest gathering of people with Birdshot and people interested in the eye condition that has ever been held! Details of the day and the programme will follow on the BUS website soon, with a link so that you can book your ticket to attend. We can also email or post the information direct to. Please get in touch with ub by email to info@birdshot.org.uk to indicate your interest in coming to the day. 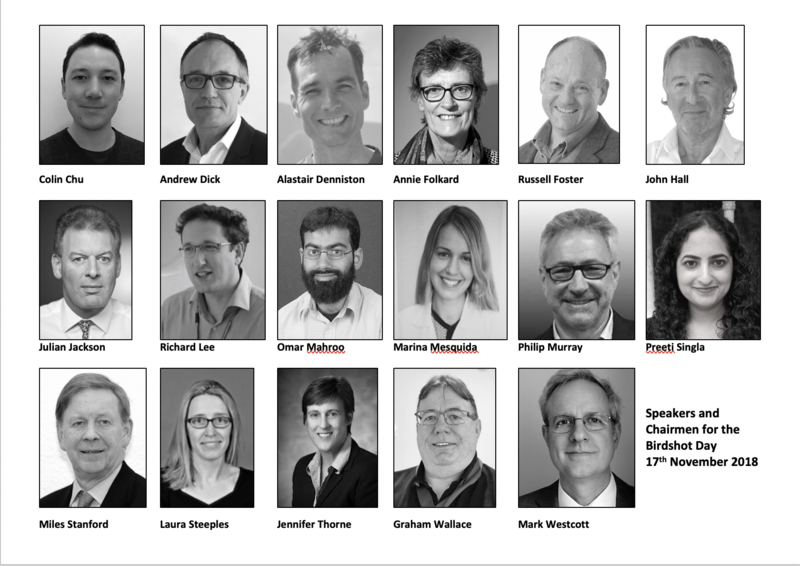 The programme is well develped and we will already have some exciting speakers and activities organised. Please put the date in your diary! The next meeting of the PINGU (Patient involvement group for uveitis) is planned for 30th September 2014 at 6:30 pm in the CRF on ward D46. This is a local support group for people with all types of uveitis that the Birmingham and Midland Eye Centre run. If you want to obtain more information about uveitis and its treatment, come along and meet others with this type of eye problem as well as some of the eye clinic staff. Please do let Sue Southworth know if you are planning to attend.